TV There's little doubt that automation has devastated the organic workforce of the country. Little by little from supermarkets to banks to factories to call centres, companies turning us collectively into Victor Meldrews, replacing people with machines or at least putting the onus of a task on to the customer rather than someone employed to provide assistance. In my own industry, and no I'm still not going to tell you what it is, what was once a profession even at a customer service level has transmuted into something rather more basic, more about being available if the machines break down or modifying the let's say product, so that it can be used within the automation on a less frictionless basis. Jobs which would previously have been available to people with for whatever reason less qualification no longer exist but unfortunately this isn't being recognised by governments, notably ours, with a benefits system designed to penalise those who can't find work rather than offer them a helping hand, which assumes that people are lazy rather than being in a position were the jobs they might have done or have done just simply aren't available. My Mum worked on a check out starting in the mid-90s for about ten or fifteen years to help us keep above water money wise, years after she would otherwise have joined the workforce and I fear that position simply wouldn't have been available now, at least with the security she had. Kerblam! suggests that in the future, we'll end up introducing people quota, that we'll artificially force companies to employ humans even in jobs which could just as easily be automated. This does not seem unrealistic although it's more likely that companies will simply end up with a proportionally smaller workforce to maintain the machines, keep things running smoothly. That's already the case in some industries, especially for tasks which require something more complex than a simple algorithm like ad-hoc shelf packing or selling a mortgage or asking for the dispatch of emergency services (although in truth both of the last two are already being achieved via an app or website). In that way you can understand why Charlie (played by Leo Flannigan who looks like a young Chris Addision) would freak out about this and want to make people scared of the technology enough that they might try and slow progress even if we can't agree with his terrorism. From a certain perspective, we could be at a tipping point were a techno-dystopia is in our future, perhaps not with human androids of some description but at least with rectangular screens willing to fulfill our every whim with even less friction than we have now. Within a few years, we'll essentially have a machine with a HAL-9000 AI in every room. But Pete "bluray booklet" McTighe's Kerblam! breaks from Doctor Who's usually more Luddite positions. In general, technology is a bad thing in this franchise with the Daleks and especially the Cybermen designed as cautionary tales of how technology could sap us of our humanity. In the modern era, stories as diverse as the Silence in the Library, Girl in the Fireplace, The Rebel Flesh, The Girl Who Waited, The Bells of Saint John, Mummy on the Orient Express, Sleep No More and countless others have been about how technologies designed to protect humans can go bad when we're not paying attention or misunderstand its application. Kerblam! is on the side of technology. The central thesis is that Kerblam! works and people are happy to receive the parcels and within the limits of the slightly totalitarian androids, the workforce is generally pretty upbeat. Like Robots of Death, it's deliberate sabotage which causes the system to break and it's that system which somehow knew to send a message to the Doctor asking for help, even if it failed to reach her a couple of incarnations later than expected. 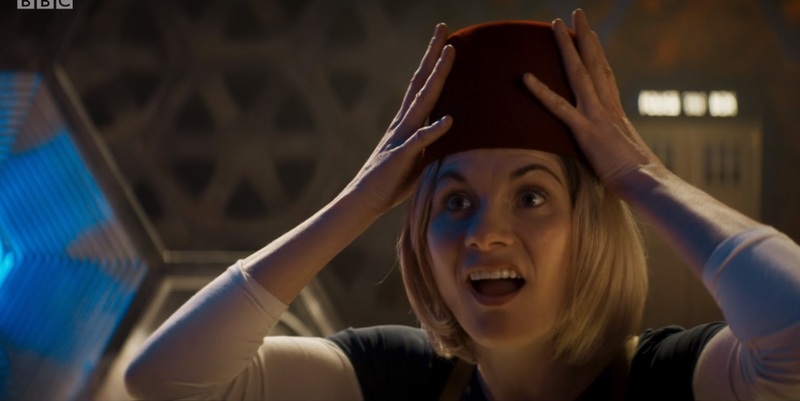 The fez moment is adorable. Along with the reference to The Unicorn and the Wasp, its good to see the show referencing its recent past more obliquely. But then, curiously, in the closing moments, we're told that essentially Charlie succeeded in his aims and that the company is returning to a majority human workforce, which seen as a win by everyone. On the one hand, yes, it means the company will employ more people but on the other it sends the message that terrorism, even if its defeated, still wins. Oh and the Doctor goes from admonishing Ryan and Graham for being robophobic when they remark on how creepy they are to blowing up an entire conscripted army of them, albeit with the best of intentions. Perhaps its this confusion within its central these which ultimately makes me like rather than love this episode. Plus there's the unrealism of how the workforce is portrayed. Despite the warnings about productivity, the actual work is portrayed as being really quite leisurely with the guest artists able to stop and have chats with nothing so much as a repeated warning. Places like Amazon would not have allowed their workers to fall behind and the processes seemed to designed more to provide the closing surprise rather than offer a realistic portrayal of the job. What kind of business loosely wraps the parcels in bubble wrap, stuffs it in an identically shaped box and then sends it out into the ether? What if the product is larger than these standard limits? Which isn't to say there isn't plenty to like, especially the banter between the main characters who're now very comfortable in the their roles, the chemistry flowing. Structurally we are very much in 60s territory, with Ryan and Yasmin fulfilling the Ian and Barbara or more closely Jamie and Zoe positions of peeling off from the Doctor in order to explore the environment or sent on a mission. A four part version of this story would have had more cutaways to the management, extra co-workers to be interacted with and more stressing on the cliffhanger moments like being discovered in the office going through files or one of the Kerblam! robots menacing Graham. Perhaps I am beginning to miss the Doctor as a more interior being. On only a couple of occasions this season have we had an intimate moment with her, most notably when she greeted her new TARDIS for the first time. Although it's fun to return to the more runabout nature of the classic series, it's interesting that the Doctor hasn't been put in a position where she's had to properly question the nature of her being. I appreciate that I've recently congratulated the show for not returning to the existential angst of previous years, but they really have to be careful that she doesn't simply turn into an expositional teacher figure. That said the supporting characters have gained some more depth than in recent years. You'll remember me rolling my eyes at the one dimensional approach to humanity in the likes of Smile, whereas the Kerblam! humans were given just enough back story and personality for us to genuinely feel something upon their demise, especially Dan the picker, gone too soon and killed off-screen. This seems to have been Lee Mack's first dramatic role and although there's only a wafer thin difference between this and his Not Going Out character, the moments when he spoke of his daughter was genuinely effective. The idea of taking on a meater part doesn't seem that far fetched. Other than that, there isn't really much more to say after a first viewing. Some Who stories are like that. They're enjoyable for the period you're watching them and then you're ready for the next with the obvious suspicion that they'll gain significance in the future within the unfolding text. The model seems to be that the more immediately "important" pieces in this season are the historicals and next week we're placing a female Doctor within a suspicious, misogynistic period and it appears when James I was at his most paranoid. Do you think she's mention having been married to his predecessor?